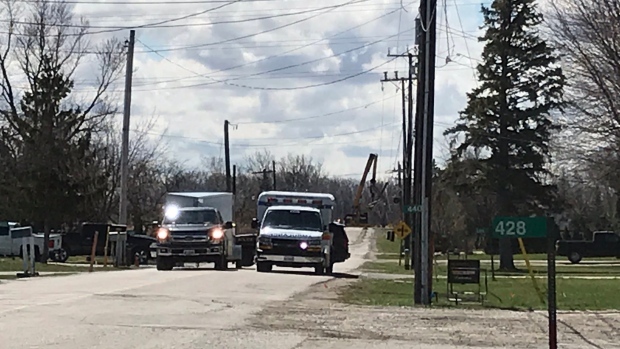 A 48-year-old Windsor man has been charged after police say a delivery truck severed a hydro pole. OPP and the Lakeshore Fire Department responded to the report of a severed hydro pole near the Canadian Pacific Railway on West Belle River Road in Lakeshore on Monday around 10:15 a.m.
Police say the operator of a delivery truck with a large boom attached, severed a hydro pole causing a significant hydro outage in the Belle River area and a closure of the rail line that crosses the roadway. Severed wires came down onto the roof of the truck and the truck driver and his passenger who were not injured, were forced to remain in the truck for about two and a half hours for the situation to be made safe by Hydro One. West Belle River Road between Park Lane Drive and Essex County Road 42 will remain closed for the remainder of the day as hydro employees repair the damage. Hydro One spokesperson Nancy Clark says they are working as quickly as possible to repair damage and restore power to about 50 customers. A restoration map shows the service has been restored. Customers affected outages can visit the outage map for updates. The Windsor man has been charged with careless driving and over height vehicle.